DealExtreme – Legit or Scam? Like I said in my previous post, my selection of Wii games to play on my PC is limited if I don’t have the sensor bar. Naturally I need to spend some more cash. I assumed it is hard to find one at local stores here at Cebu City, Philippines; hence, I resorted to buying online. One particular store that was mentioned in the forum of the Wii emulator Dolphin was DealExtreme. So far I’m still waiting for the delivery to arrive. I even wonder if I will ever get a hand at the sensor bar I ordered. So is DealExtreme a scam website? I could not find a credible source that says it is or not. There are some user comments pointing out average customer satisfaction, although some are saying they had a bad shopping experience there. It accepts payment through Paypal. Amazon doesn’t. Cheap to no shipping cost. Whereas Amazon restricts some shipment, DealExtreme can ship tech gadgets to my country. As for my take on DX’s credibility, I cannot say. At least not until whether I receive my order or it has already been long overdue. I will have to wait at least two more weeks before I can have my final verdict on DealExtreme. It does sport a McAfee secure logo though, which can be verified from the antivirus company’s SiteAdvisor product. Anyway, it turned out I was wrong in having trouble of finding a sensor bar at a local store. After asking three stores or so, I found a legit sensor bar tagged at Php1500.00 (around $35). Did I buy one? Nope. 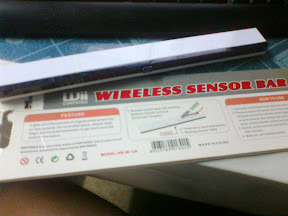 I was even more lucky to find a cheap third-party sensor bar for only Php300.00 (around $7). That’s only $2 above my DealExtreme order, and that’s without the waiting. I was actually playing Mario Kart Wii on my PC moments before writing this article. Before transacting with Deal Extreme and other online hot deals shopping sites, it's best to do your research. Community forums can provide the information you're looking for. Good luck!